One of the best parts of being a teacher is being able to offer children something exciting and different to do. When I received news from Norwich Cathedral that they were holding a Be A Chorister Day I mentioned it to the children in the choir. How fabulous that four of them plus Daisy decided to take up the opportunity and give up their Saturday to try something out of their normal comfort zone. Below is an account of the day written by Alice and Meg ( thank you girls for sending it to me). As you can tell they had a great time. It was a privilege to sit in the congregation, with the supporting parents, for the Evensong service, seeing and hear the children sing with all their hearts alongside the boy and girl choristers from the cathedral was a very special and moving moment. On the Saturday 19th January a group of young singers took a day to find out what a day would be like as a chorister. From All Saints, Stibbard James, Will, Alice,Megan and Daisy experienced this opportunity. When we got there they had a speech about the school and followed on with drinks and biscuits. After that, we went in to a room where we did some vocal warm up. Moving on, we went to a rhythm session. We used percussion instruments and created several songs. That went by quite quickly and before we knew it it was lunch. Lunch was a lovely buffet and we all enjoyed it. For our afternoon lesson we got handed a leaflet and it had many songs on it as well as the service that happened at 3.30. We learnt it and went down to the Cathedral. At the end of the service we got given a goodie bag full of souvenirs. We enjoyed this day very much and would love to experience it again. Today I took the children to Gresham’s Preparatory School so they could take part in the WCET Music Hub’s Sinfonia concert. The children were absolutely fantastic and had a wonderful day. I was proud to be with such a talented, confident and happy bunch of children. They sang, danced, played their violins and used percussion instruments alongside other children. All were amazed to be inside such an interesting ‘tent’ and join in with a performance on such a large scale. Well done Year 4 and also to Mrs Clinton for all her hard work this year, getting the children to such a high standard with their violin playing. 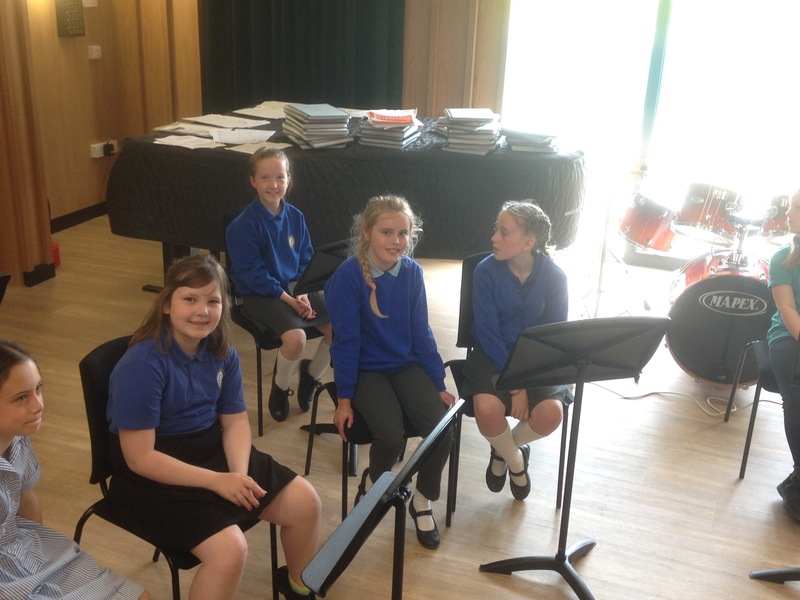 On Tuesday the 16th of May we went with Mrs Budgett to Greshams Prep School for an amazing opportunity to play the violin. Only four lucky people got to go (Alice Roberts, Georgie Hunt, Callie Walden and Zena Yaxley.) We were welcomed with a great and yummy selection of biscuits and a drink. We played Pomp and Circumstance and The Blue Danube. We called ourselves The UpBeat Sinfonia. There was a great variety of instruments such as Trumpets, trombones, French horn, Violins, violas, cellos, clarinets, flutes, oboe and a drum kit. It was a terrific day being able to play in a big orchestra for the first time. Miss Roberts, the Head of Music at Greshams made us feel very welcome. We had a lovely hot lunch there and were also given a tour of the new music facilities at Greshams School which cost £6 million!